Jacob Hilderbrand, co-owner of this site and VBAExpress.Com founder is one of the premier Microsoft application developers, working in all of the Microsoft applications at the expert level, including the Mac versions as well as SQL Server and VB.Net. VBA (Visual Basic for Applications) for a variety of Microsoft programs, including Excel, Access, Word, Outlook, PowerPoint, Video, and Project. VBA is a simple but effective code that, in the right hands (or at the right fingertips) can be used to customize the capabilities and functions of numerous applications. VB.Net for Microsoft Visual Studio. Similar to VBA, this language allows Jacob to direct and modify data sets, structures, and their attributes. SQL (Structured Query Language) for Microsoft SQL Server, Access, and MySQL Server. This code can be used to manipulate the information contained in relational database management systems, which are key for the information technology-related activities of many businesses. HTML (Hypertext Markup Language). You can’t build websites without this ubiquitous code, which provides the details for the graphics and functions of pages. PHP (Hypertext Preprocessor), an additional language used in synthesis with HTML to make pages more interesting, innovative, and useful. Over the past 11 years, Jacob has used these skills to help thousands of clients solve their problems and achieve their goals. In 2004, he created VBA Express, a free self-help question and answer forum. He also developed an Excel VBA Training and Certification program to go along with this invaluable information technology resource. This program allows users to go through a series of lessons, ask the VBA Express experts any questions they may have, and earn a special certification upon passing an exam the team designed. This platform also hosts other paid services to help clients make the most of Microsoft. 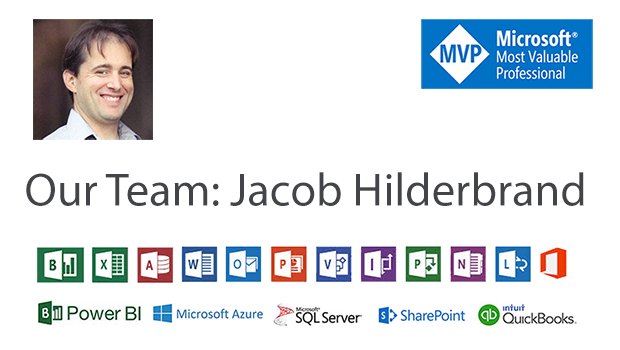 Jacob is the lead VBA Consultant on this site and has contributed more than 3,500 posts to date. He has also authored approximately 100 code samples for the Knowledge Base section of VBA Express, which visitors to the site can use to enhance their operations, and regularly publishes blogs. As a co-owner of VBA Express, Jacob also guides the direction of this platform and related sites. Want to learn more about this maverick?